Sometimes you want lists. HTML offers three main ones but one is a bit specialist so here are the other two. 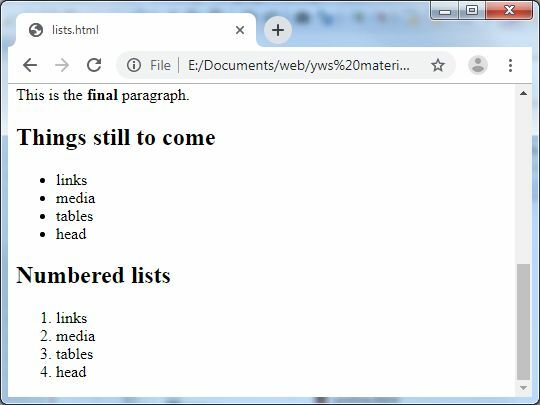 Save textemphasis.html as lists.html. Add a new h2 heading saying Bullet lists just under the final paragraph (but before the /body tag). Fix the indentation if necessary. The ul starts the unordered list and the li tags are for the list items inside the list (and indented one more tab). Save and view. Now add another new heading Numbered lists after the bullet list (but before the /body tag. You can copy the first list and paste it below this new heading. Then change ul to ol and /ul to /ol. Save and view. You should now have two lists - one with bullets and one with numbers.